I’ve already gushed over my love for Boston (even though I’ve never actually been there), so trying this recipe was a bit of a non question for me. Yes please! I gravitate towards candy recipes because they are almost always things that I can actually eat. But the truth is that I’m just not very good at them. And I can’t figure out why. I watch my candy thermometer really closely, and I do everything the recipe tells me to, and yet I rarely get it right. I was pretty certain it wasn’t going to turn out from the second step. I had my sugar mixture on the stove for 40 minutes and my sugar never dissolved. I went ahead and finished it out anyway, knowing the taste would still be wonderful, even if the texture wasn’t right, and that absolutely proved to be true. It was slightly grainy, but tasted oh so wonderful! Butter an 8×8-inch baking pan. Line the pan with a piece of parchment large enough to hang over two sides. Butter the paper, too, and tuck it flat against the pan. 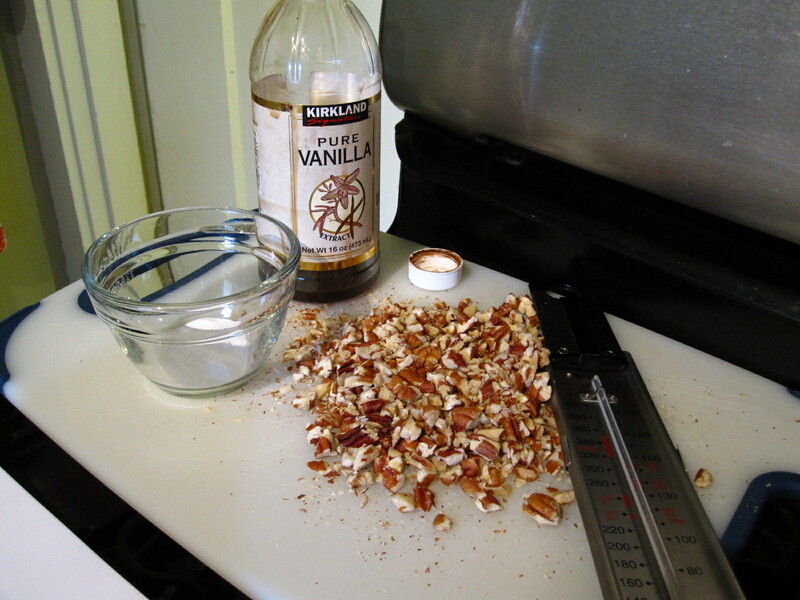 Put the chopped pecan pieces in a handy spot where you’ll be working. 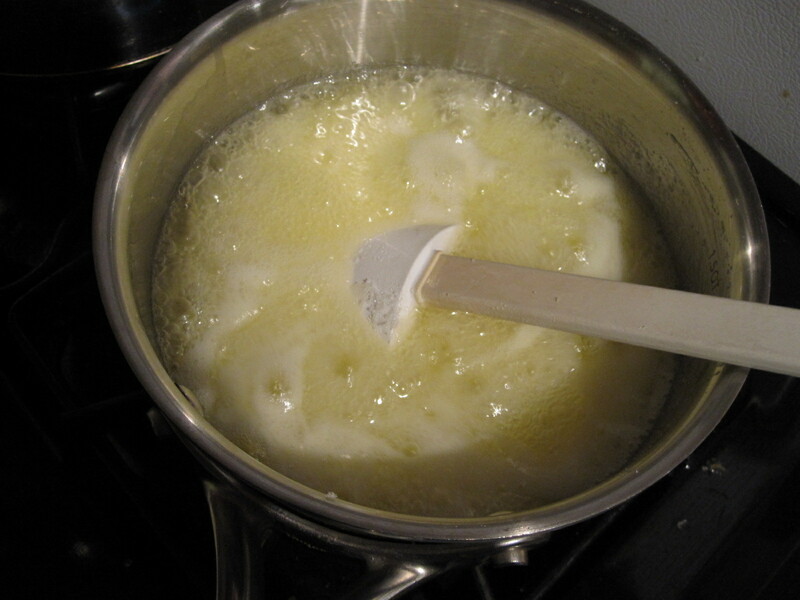 Combine the sugar, salt, Karo syrup, half-and-half, cream, and butter in a heavy-based 3-qt. pan, stirring with a wooden spoon over low heat until the sugar is completely dissolved. This can take a while, and it’s hard to see; you should feel the texture (rub a little between your fingers or run your finger along the mixture clinging to the spoon) to be sure all the sugar is dissolved. Turn the heat to medium and cook, stirring, until the mixture foams to a boil. Add the baking soda. Lower the heat and stir like mad. The mixture will double in volume and then gradually subside and begin to take on a golden hue. After the mixture settles a bit, put in a warmed candy thermometer. Continue to stir constantly, scraping the sides, and cook over medium-low heat until the thermometer registers just 240°F. Watch very carefully, as the thermometer will hover at 239° for a while and then move up. You must remove the mixture before it passes 240°F. Remove the pot from the heat and take out the thermometer. Continue to stir quickly. The candy will look like a loose caramel sauce. Add the vanilla (watch out, it may sputter) and stir carefully to incorporate. Add the pecans and continue stirring quickly. 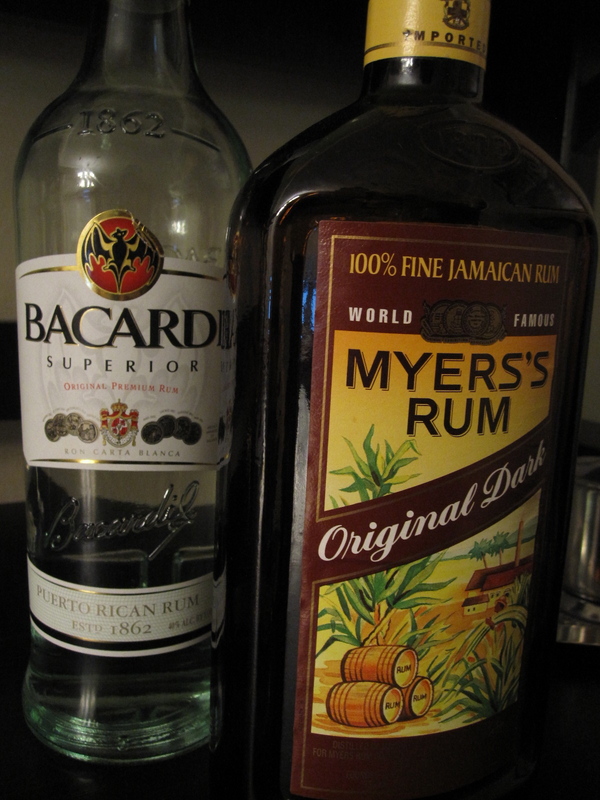 Don’t take your eyes off the mixture at this point. Watch and feel it as it begins to thicken, lighten in color, and become harder to stir. When it has thickened enough to leave a path on the bottom of the pan while you’re stirring, it’s just about ready. 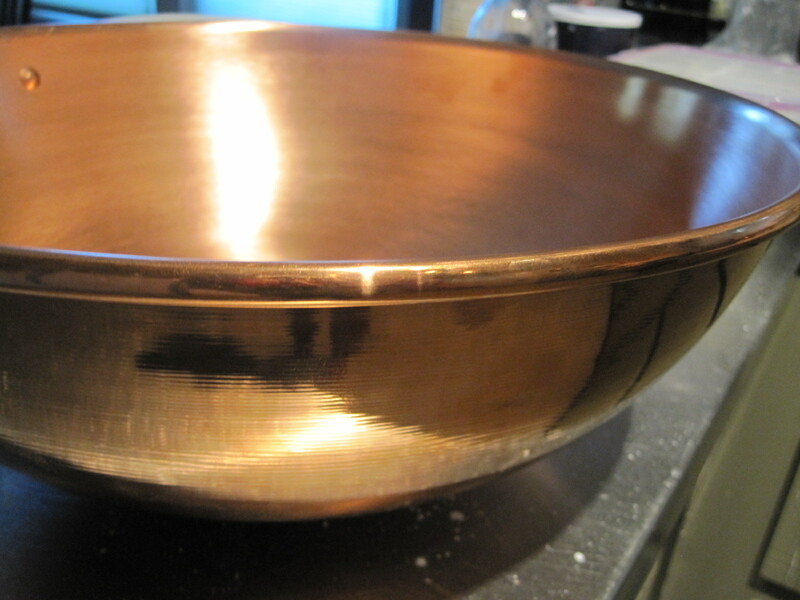 The moment you notice that the mixture is just beginning to lose its glossy shine, turn it out into the buttered pan. Don’t wait until the mixture looks completely matte or it will be too dry when you try to cut it. If you stop stirring at the right moment, the mixture will firm up almost the second it hits the pan. Too soon, it will never be anything more than caramel (although very good caramel); too long, it will harden in the pot. As soon as the candy cools (15 to 20 min. ), cut it into squares. It will probably have tiny bubbles on top. It may well crumble when cut. If it doesn’t harden immediately, just let it sit for several hours, even overnight, and it may harden. If not, you have great caramel. 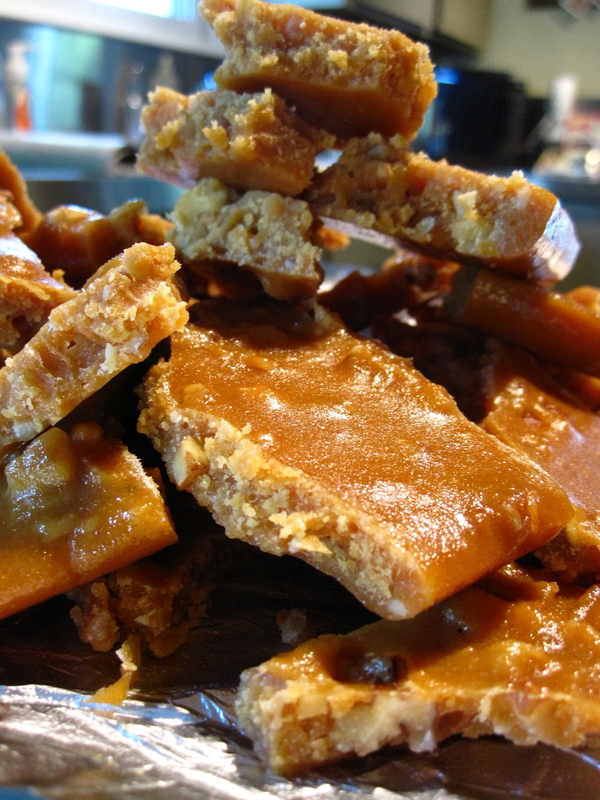 What I love about this caramel candy goodness: It tastes amazing, even when you screw it up. 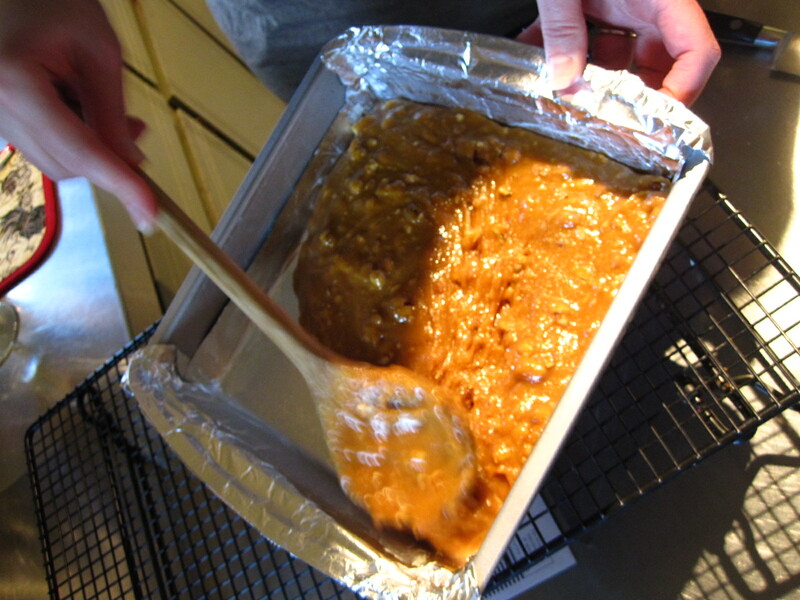 What I hate about this caramel candy goodness: Eh…it was difficult. Really, really difficult. And I think I still have a cavity. Today’s new recipe is a muffin that sounded scrumptious, but turned out to be unexciting. They had practically no flavor at all. I thought about not even including the recipe because it just doesn’t seem to be worth it at all, but decided I would let you decide for yourself if you wanted to try it. Should you decide to give it a go, don’t say I didn’t warn you. I noticed on the recipe that it states you need to use VERY ripe bananas for the flavor to be there, and mine were literally black, so I don’t know what else to do to get some flavor to burst out of these little muffins. 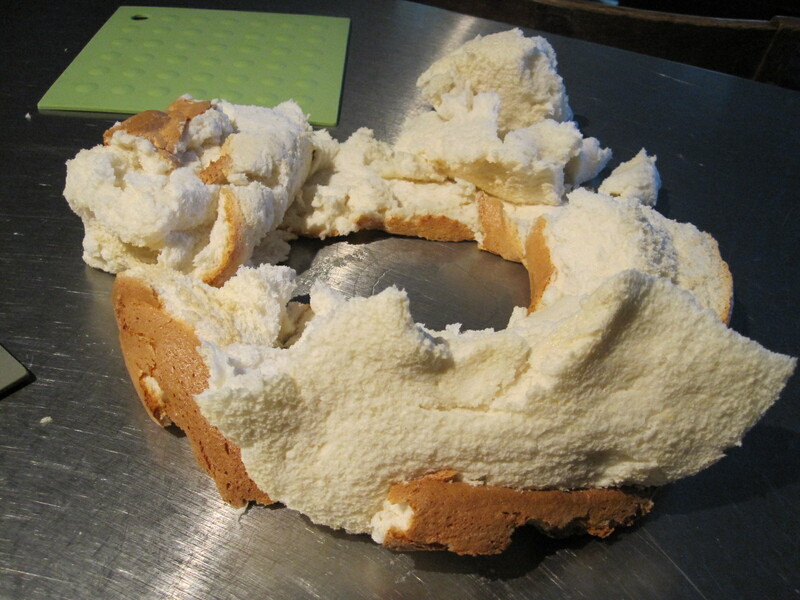 This is the risk you take in trying new recipes. Sometimes they turn out, but it’s not a good recipe to begin with, so even following directions perfectly doesn’t help. Combine the flour, cocoa, baking soda, and salt in a mixing bowl and stir well to mix. In a separate bowl, stir together the mashed bananas and sour cream; set aside. 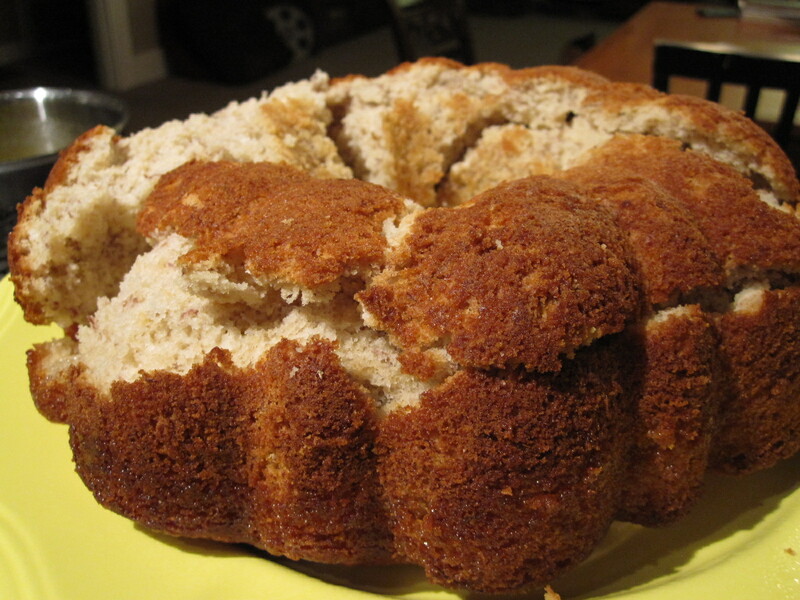 Combine the butter, sugar, and brown sugar in the bowl of an electric mixer, fitted with the paddle attachment. Beat on medium speed until well mixed and a little lightened in color, about 1 minute. Beat in the eggs one at a time, beating smooth after each addition. Decrease the mixer speed to low and beat in 1/2 the flour mixture. Stop the mixer and use a large rubber spatula to scrape down the sides. Beat in the banana mixture and once this is well absorbed, add the rest of the flour mixture and mix well. 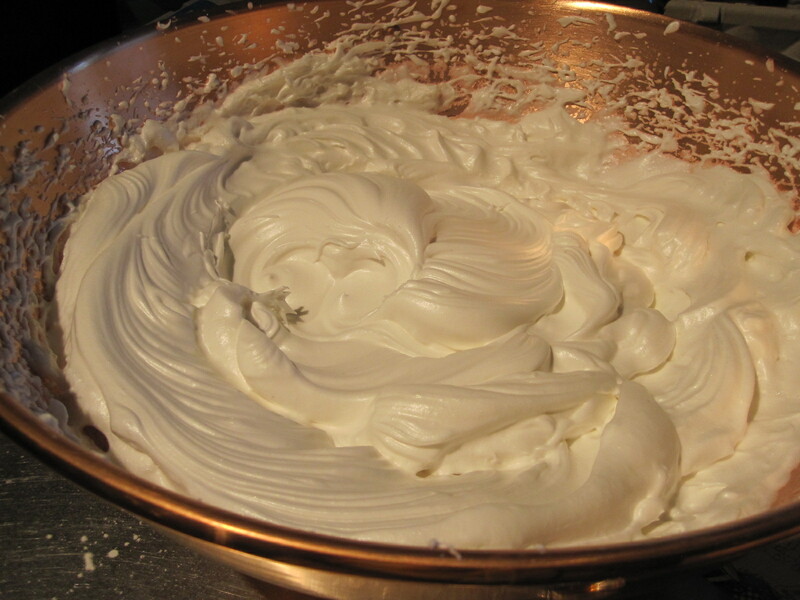 Remove the bowl from the mixer and use a large rubber spatula to give a final mixing to the batter. Divide the batter equally among the muffin cups in the pan. Bake the muffins until they are well risen and feel firm to the touch, about 30 minutes. Cool the muffins in the pan on a wire rack. 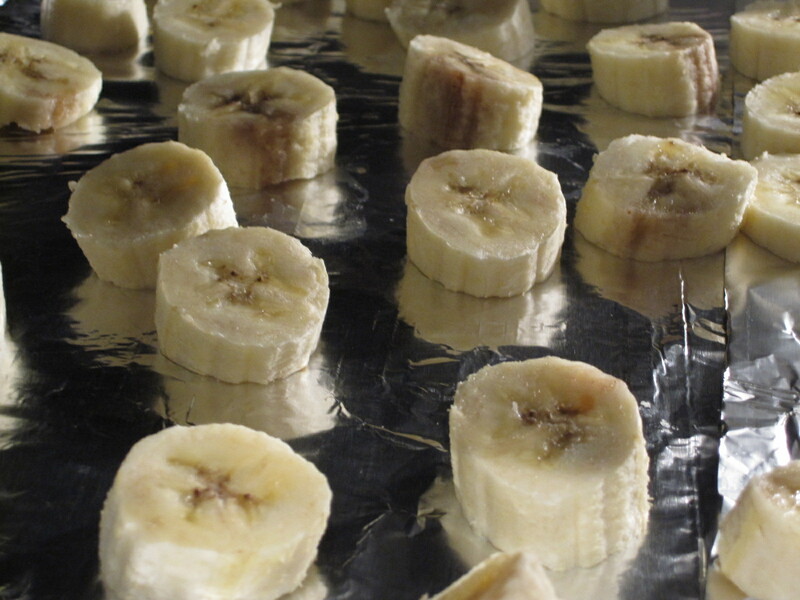 **For the best banana flavor, make sure to use very ripe bananas. Their peels should be covered with dark brown, if not black, speckles. 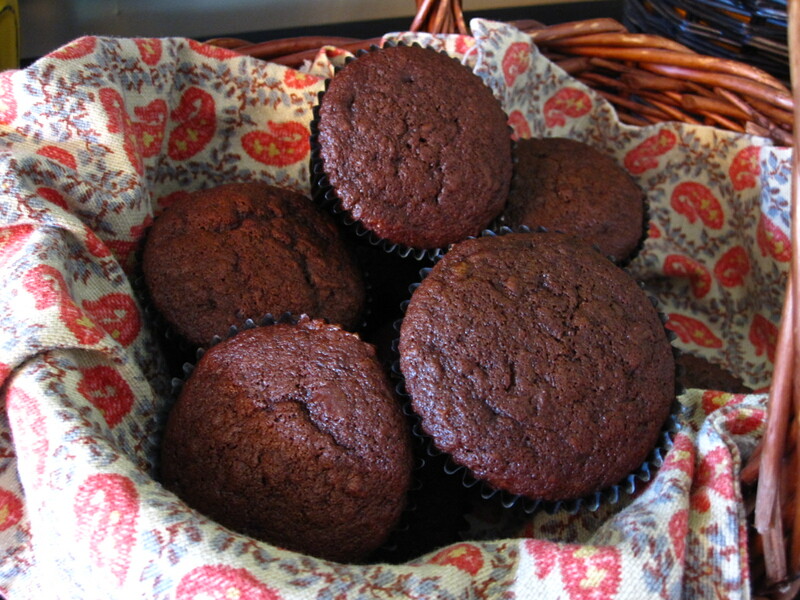 If the bananas are not ripe enough, these will taste no better than cocoa potato muffins. What I liked about these muffins: Absolutely nothing. What I hated about these muffins: Absolutely everything.